Imagine a world in which antibiotics didn’t exist. Imagine if instead of requiring a week-long prescription and bed rest, a bout of pneumonia was fatal. Or if a staph infection couldn’t be cleared up by a simple cephalexin regiment. You only have to think back about 90 years to realize this hypothetical scenario. Prior to the discovery of penicillin by Alexander Fleming in 1928, such common bacterial infections were debilitating and potentially lethal. And we as a species are slowly (some would argue rapidly) regressing to this scenario. Thanks to bacterial drug resistance, our line of antibiotic defense is becoming obsolete. Antibiotic research is a tricky area. It’s an evolutionary arms race of sorts — humans come up with new antibiotics, then microbes acquire selective resistance to them. Repeat ad infinitum. Except we can’t repeat forever. Not at our current pace. See, there are about a dozen classes of antibiotics. They are generally classified by structure and by mechanism of action. Medicinal chemists can make minor tweaks to existing structures, which generate new antibiotics that are very similar to the old ones. This can stave off bacterial resistance for a little while. But in order to really put the pressure on microbes, you need a whole new class of antibiotics. And it’s been over 30 years since we discovered a new class. Until this week. Enter last week’s article in Nature. 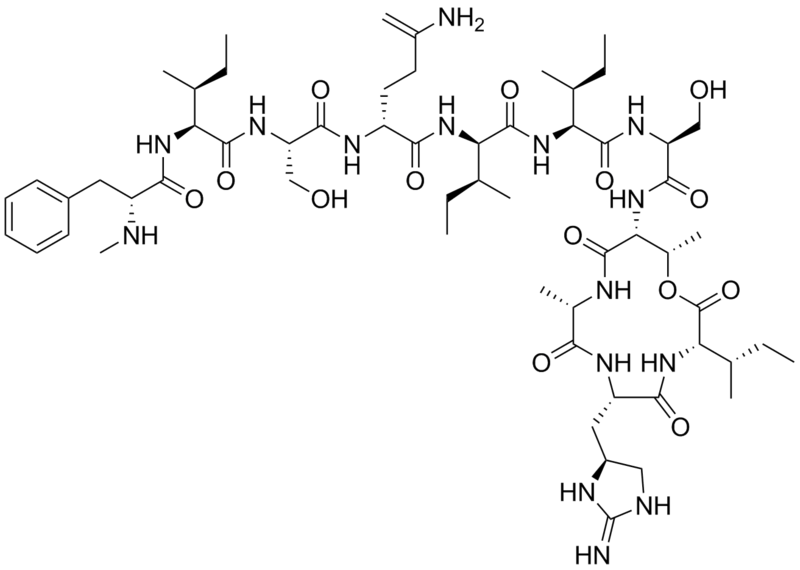 A team of researchers spanning industry and academia published a very interesting paper in which they describe the discovery of a new antibiotic, termed “teixobactin.” It’s large, has lot’s of chiral centers, and has some strange looking amino acid residues. Teixobactin scores respectably well against a host of pathogens, as shown in “table 1” in the paper (reproduced below). In some cases, it even surpasses the efficacy of current generation antibiotics. In mouse models infected with methicillin-resistant S. aureus (MRSA), all animals treated with teixobactin survived down to doses as low as 1 mg/kg body mass (single dose, i.v., 1 hour post-infection). Serial passage of S. aureus in the presence of sub-MIC levels of teixobactin over a period of 27 days failed to produce resistant mutants as well. This usually points to a non-specific mode of action, with accompanying toxicity. However, teixobactin had no toxicity against mammalian NIH/3T3 and HepG2 cells at 100 µg/ml (the highest dose tested). The compound showed no haemolytic activity and did not bind DNA. This is pretty important, since it indicates that teixobactin seems to act with selectivity; there are lot’s of compounds that kill bacteria very effectively, but will kill your body’s cells as well. The team went on to investigate the mechanism of action of the new compound. They found that it acts as a peptidoglycan synthesis inhibitor; the peptidoglycan layer forms the cell wall for bacteria, and is essential to their growth and survival. Teixobactin appears to consume precursors to peptidoglycan synthesis, and does not appear to act directly on any known protein targets. This distinction is likely the reason bacterial cells do not develop resistance to the compound. But, what’s even more important than the discovery of this new antibacterial compound is the method used to discover it. All of the antibiotics that have so far been discovered have been through isolation of chemical compounds made by other organisms. Interestingly, bacteria themselves often generate antibacterial compounds. Perhaps somewhat counter intuitive, but it makes a good deal of sense from an evolutionary perspective; if an organism can produce a compound toxic to other species, it gains a powerful tool for survival. A major challenge for scientists is growing bacterial cultures in the laboratory. Some, such as E. coli and S. aureus, grow quite nicely on Petri dishes. The other 99% of bacterial species cannot be cultured in the laboratory. Since this bulk of the bacterial biosphere cannot be easily cultured, it has never been screened for antibacterial properties. The researchers in this paper came up with a piece of technology they dubbed the “iChip” (Steve would be proud). The iChip allows a single bacterial cell to be isolated from a soil sample, while being kept separate from the rest of the soil microbes. The cell, affixed to the chip, is then placed back in the soil from which it came, where it can multiply into a colony. The large colonies produced can then be grown in vitro as is typical for “well-behaved” microbes. The optimists out there are hopeful that new-found access to “unculturable” bacteria will allow scientists to rapidly screen for natural product-based antibiotics. Of course, like with so many other discoveries, only time will tell if this method proves to be of practical use for drug discovery.